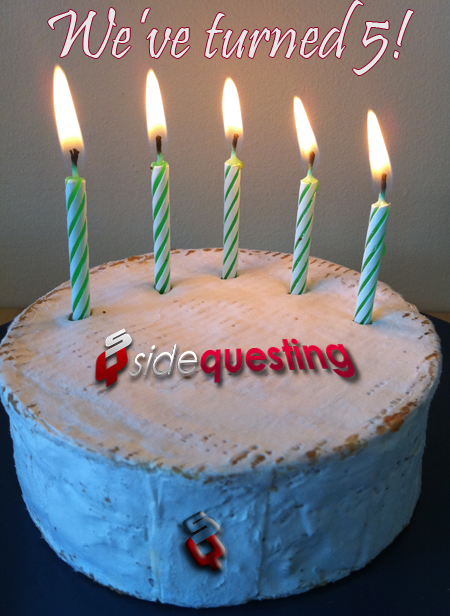 Home » Contest » SideQuesting is Five! Five years. It is crazy that it has been this long. I started about 18 months into this grand adventure, but I ended up here for the same reasons everyone else did: an innate love of video games and the aspiration to explore them on a deeper level. Most, if not all of us were inspired by the work of Joystiq, and more specifically Chris Grant, Ludwig Kietzmann, and Justin McElroy on the Joystiq Podcast. If you’ve been following us for this entire time (first of all, thank you, it truly means a great deal to us), then you have seen us change, change again, change back, and then change 37 other times. It was never change for the sake of change, as we have always strode to be better at what we do. Not only have all of us become better writers over time, but it was a change in attitude, and philosophy. Because of great leader Dali, SideQuesting was more than a games coverage site. It was a launchpad. It was a place for young writers to be nurtured by some truly talented folks. As a writer, you were never more than an email away from talking to a fellow writer, or a senior member of the staff to get some advice on your latest piece. Not to toot our own horns too much, but it was so well known that this is what we did that multiple people have emailed the staff asking for advice, or even simple help with a copy edit job. Speaking for Dali, I know that in the time SideQuesting has been around, nothing has made him prouder than both being the proving grounds for young talent, and seeing said young talent move on to bigger and better things. It is a good feeling knowing that you are instrumental in fostering talent and pushing people to be as good as their ability will allow, and we hope to do it more in the future. So again, thanks for reading us! We never thought we would have a following at all, let alone the exponential year-on-year growth that we have achieved. We hope to keep improving and growing! Oh, and I have a few Steam keys for some random games here. Comment on this post if you would like one of them. US only. I’ll pick the lucky winners on Tuesday! One more year until we turn six!